Wouldn't getting cost estimates for vinyl siding installation be easier if you knew what to look for in an estimate? The owner of Woodstar Remodeling in Des Plaines, Ill., Brian Krause offers advice on the three things you must know about before obtaining vinyl siding cost estimates. "One thing I would look for is how many squares of siding are being installed," explains Krause. A square is equivalent to 100 square feet and is the typical unit of measure that siding contractors use. Because contractors take measurements of your home to prepare your estimate, the estimates' "squares" should be similar. "For the most part, the numbers should be fairly close. If the numbers are off by one square, that wouldn't concern me. Everybody calculates a little differently." If one contractor suggests the need for far fewer squares than the others, Krause recommends proceeding with caution and asking more questions. Krause explains that all vinyl siding is not the same: "You want to make sure you know what product you're actually buying. Way too often in the vinyl siding market, I see quotes that are for just 'vinyl siding.' Are we talking about high-quality 0.046 siding or lower-quality 0.040?" 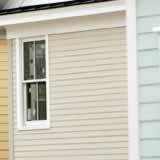 As a guideline, the thickness of siding is a quality indicator consumers can fall back on. Krause recommends communicating your cost and quality purchasing priorities to contractors when you contact them for quotes, just as you would a salesperson, when purchasing a vehicle. "Most installers have access to many different products, many manufacturers, and many different thicknesses, so when they come to your home, they come prepared to talk to you about what product you're looking for." A warranty should be included in the estimate, says Krause. "Your estimate from most contractors is going to be your written contract. It should specify the number of years of coverage. You want to make sure it includes the labor warranty from your installer, and you also want to make sure you know what the manufacturer's warranty is." He recommends asking the contractor to provide the manufacturer's warranty card with the estimate, so that you know exactly what that "lifetime warranty" really includes. Though labor is a big chunk of cost, don't look for it on your estimate. "Most people aren't going to break out labor costs. Contractors make a bit off of labor and a bit off of the product," explains Krause. He estimates that labor accounts for one-half to two-thirds of a project's cost. The hidden cost on an estimate is the bit extra you might pay for a reputable contractor who gets work completed on time; is easy to work with on your project; and who you'd like to work with again. "Make sure you're working with a good contractor," cautions Krause. "Prices are all over the board and there is a very big difference between contractors and why contractors' prices vary."